Fires involving motorhomes are rare, but when they do occur the risk to the people inside is very high, and the damage to the motorhome itself is often very severe, leading to an insurance write off. This is one of the reasons it’s important you choose specialist motorhome cover when looking to insure your motorhome. As well as having insurance in place it is important that motorhome owners take a few sensible precautions to reduce the risk of a fire occurring, and to be in a position to remain safe and minimise damage should a small fire breakout. Don’t overlook the importance of smoke detectors, as even during the daytime fires rarely break out while you’re paying attention. Plus a smoke alarm is the first line of defence, warning you when something has started to give off smoke before it has actually set alight, which can help you to avoid any severe damage being caused. It’s important that you position your smoke alarm so that it is facing downwards, not horizontally, in order for it to work at its most effective. If you have a large motorhome or American RV you may want to consider fitting more than one smoke detector in order to be completely safe. You should also test your smoke alarms’ batteries regularly by pressing the test button and listening for the beep, and store spare batteries in the motorhome at all times in case the current ones are running low and need to be replaced. Gas and electric appliances should be checked annually to ensure they are in full working order and not liable to malfunction. Often a basic safety check of gas appliances will be done as part of a habitation area service carried out by a motorhome dealership or service centre, but often a full service of your Gas appliances by a Gas Safe Registered Engineer will be an additional service. Also don’t forget that it isn’t just the cooking and heating appliances which can cause a fire, but also appliances such as the motorhome’s fridge freezer if not working properly. In fact one of the worst claims for fire damage which we handled last year was caused by a fridge freezer’s exterior elements overheating and setting fire to the side of the motorhome. Luckily nobody was hurt but the damage to the motorhome itself was substantial. Cooking on a BBQ when on holiday in your motorhome is not only one of the most enjoyable ways to cook, it is also a great way to keep the inside of your ‘van clean and clutter free. But it’s important that you take a few precautions to ensure your BBQ won’t cause heat damage to your motorhome, or cause a fire. The first thing is to always ensure there are at least 2 metres (6.5 feet) between the BBQ and your motorhome or any awning to ensure that should the BBQ fall over it won’t land anywhere near the side of your ‘van or awning material that could catch fire. You should also never use a BBQ underneath a canopy or awning as the heat rising from the grill can seriously damage the material or even set it alight. Finally, make sure that children are not playing near to the BBQ, whether it’s a teenager on a skateboard or a toddler with a football, and that adequate care has been taken to ensure the BBQ is out of the way and not likely to be knocked over. 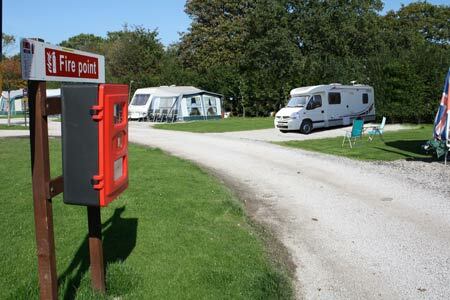 Fire blankets and extinguishers are essential bits of kit for any motorhomer, and can be picked up relatively cheaply if not already installed to your motorhome. A multi use dry powder fire extinguisher designed for A, B and C class fires can be used to extinguish most small fires you would get in or around your motorhome including burning fabrics and wooden fixtures and fittings. Fires originating from fats or cooking oils are known as F class fires. An ABC fire extinguisher shouldn’t be used to combat such fires. Instead invest make sure your motorhome is kitted out with a fire blanket that can be thrown over minor cooking fires. Whilst many fire extinguishers do have expiry dates some portable ones such as those used in caravan and motorhomes don’t always have one printed on them, if this is the case then a good rule of thumb is to replace a fire extinguisher every 5 years or immediately after use. Fire blankets can be stored indefinitely if unused, but just remember to keep it in a handy location where it can be accessed quickly and easily when needed. Used quickly and in the correct way a fire extinguisher or fire blanket can be used to put out small fires and avert your motorhome from being completely destroyed. However, you should only tackle small motorhome fires that you feel confident of extinguishing. Do not attempt to extinguish a fire if: it is quickly spreading; it could block your escape route from the motorhome; it is not obvious what is burning; there is excessive smoke; there is a possibility of explosion such as fire near your gas bottle. If in doubt get all occupants away from the motorhome asap and call the fire brigade. What a shame! With regard to your BBQ section. There is currently a campaign running advising ” not to bring a finished/expired barbecue into your tent/van (for warmth) as lethal carbon monoxide is released and causes the death of dozen people a year”. Perhaps you could report it in you next article. quote; but often a full service of your Gas appliances by a Gas Safe Registered Engineer. you are joking, i would not let a plumber, gas safe engineer quote. near my motorhome. he/she wouldn’t have any idea of how a motorhome set up works.